I am working on a painted canvas done by the artist Charlie Harper. The raccoon is a delight but I was worried about how to make the corn cob appear the way that the artist painted it. 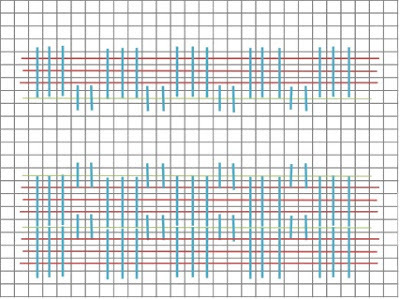 Here is the stitch that I came up with. Continue in pattern to fill space. I love anything by Charlie Harper!! This is really coming together nicely Carolyn. Where do you find those canvases? They look like fun. I have a postcard book of his designs and another Coloring Book that I found somewhere. I keep thinking I'd like to stitch some of his designs. I got mine in Michigan at a trunk show. You could try contacting Teresa at shop@homesteadneedlearts.com in Grand Blanc MI. She is very good at getting things and I think she was doing a Charlie Harper Owl class there with Kathy Fenchel. They might even have some still available with a stitch guide. Carolyn, I love this pillow design and what you are doing. I too will look for Charlie Harper canvases.